What a whirlwind the last two days have been! Hard work, good food, laughter, goats, and more châteaux than we could shake a stick at! After several days with our host families, what a delight to see each other again today! And as if that weren’t exciting enough, we got a chance to visit le Futuroscope, a theme park celebrating science, technology, and the world of the future. Poitiers has often been called “the city of a hundred bell towers”, and today we had ample opportunities to see why! Today, we went back to school for a day of class at the lycée de St-Jacques de Compostelle, a local technical high school. It was a great opportunity to compare our first night with our host families, and to talk about the culture shock that we’re all experiencing. 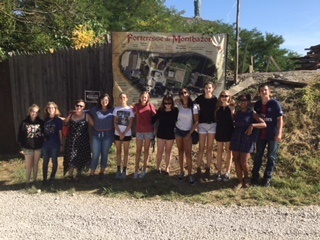 ...le coeur ouvert à l’inconnu… We’re certainly keeping our hearts open to the unknown: today we transfered to Poitiers and met up with our host families! It’s a little bit nerve-wracking to stay with a family for a week, and doubly so to do so in a foreign language, but our migrateurs are more than up to the challenge.